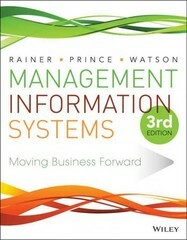 Management Information Systems 3 Edition The 3rd Edition of Management Information Systems promotes active learning like no other text in the market. Each chapter is comprised of tightly coupled concepts and section-level student activities that transport your students from passively learning about IS to doing IS in a realistic context. The integration of Microsoft Excel and Access exercises at the end of every chapter enables students to practice their Microsoft application skills in the context of the chapter material.